Alyssa Carlier | The Devil Orders Takeout: Does Disney NEED to cast a Chinese actress for Mulan? Does Disney NEED to cast a Chinese actress for Mulan? There has been an insane amount of enthusiasm (yep, nice non-controversial word) about casting a Chinese actress for Disney's live-action remake of Mulan. 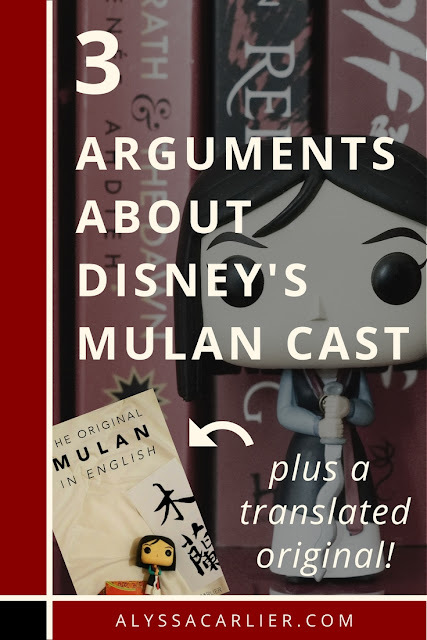 Plus read a translation of the original Mulan now! Let me just say this: if Disney tries to cast someone ridiculously off the mark as Mulan, I can only conclude they have been hijacked. Dammit, Hydra. But does she absolutely, definitely have to be Chinese? I really appreciate the amount of thought and effort people are putting into this petition. To whitewash, or wash in any colour you like from black to purple, an integral part of Chinese tradition would be horrible. Let's address both of these. The Mulan actress must not just be Asian, but Chinese. First, a dash of humour. So what about Taiwan? What about Hong Kong and Macau? I can tell the difference between a mainlander and a HKer about 80% of the time. My mum has a better rate. Are we Chinese? Would it be okay if the actress was Taiwanese? Whoops, what if they come from the Spratlys or Diaoyu Islands or one of the many islands China thinks belongs to them? Yeah, those islands aren't populated. But remember: China has been around for a looooong time. And our borders have changed. Any sort of cultural identity is fluid. While I believe a Chinese actress would bring their own experience to any adaptation, I think there are more important "Chinese elements" that a live action adaptation needs. ETA: It is absolutely fantastic that Disney has decided to strive for cultural authenticity, though. The Mulan actress must not be only half-Chinese and must look Chinese. To be fair, I think the original posters meant "don't find someone half-Caucasian and looks Caucasian". I don't think I need to point out how ridiculous it is to exclude biracial people — and seriously, if you're judging whether people are ~Chinese enough~ or ~Asian enough~? Sit down in a corner and hug a slimy octopus, thank you. In the meantime! The type of Chinese person you see most is Han Chinese. However, there are also 55 ethnicities living in China and are also part of Chinese culture. We all have fabulous fashion and cuisine. To ask for someone who looks Chinese is to ask for someone who looks American. Should an American be white and blond and tall, or an African American, or an eagle? And in the case of China, because we have an insanely long history of wars and whatnot, there has definitely been some mixing in terms of ethnicity, so the lines aren't quite that clear. Oh, and just some food for thought. Mulan is a folktale that originated during the Northern Wei Dynasty. During this time, the country was a mess and refugees were fleeing left and right and north and south. It's also, according to my history textbook*, a time when people of different ethnicities started integrating to some extent within China. It's entirely possible that Mulan wasn't even Han Chinese. She was said to be fighting for the foreign 可汗, a title for Mongolian kings. *ETA: I have now discarded this textbook. If you were forced to take Chinese history in school, please treat yourself to a marvelous slice of cake. Who is Chinese? How do we define China? This isn't something I can cover in one blog post, or even in a blog series. It's a question that's tangling Hong Kong even now as we struggle to reconcile our differences with Beijing. But the presence of this question, I think, undercuts the absolute nature of saying "The actress for Mulan must be Chinese". All I really need Disney to do, in terms of casting, is to convince me in the theatre that this is a Chinese folktale. Please get rid of the forced-into-marriage subplot? It's not unrealistic, but it overcomplicates Mulan's motivations. Doesn't preclude romance. Why Mulan left = she loves her family. Arya Starks unnecessary. Let's say this again: Mulan does not need to rebel against "convention". The original ballad starts with her weaving, for goodness' sake. It ends with her reapplying makeup. Courtesy. Greetings, precedence, tea, everything, for worldbuilding. Filial piety, i.e. respect and love for parents. Expectation to care for them in their old age. Patriotism patriotism patriotism. We are worse than America and their eagles. Integrity. Mulan is lying via proxy to the emperor and to everyone else. A huge no-no in Confucian values. Character motivations, please. Please include older sister present in original, because sisterhood. Please make the scenery and the fashion look like they're Chinese. This is literally the best part of ANY c-drama and Disney needs to bring their A-game. Those pets were cute. But they do not belong in a live-action film. Exception will be made for bunnies. Your thoughts on the live-action Mulan? Are you excited or worried about it? I AM VERY WORRIED. Disney, don't mess up. P.S. 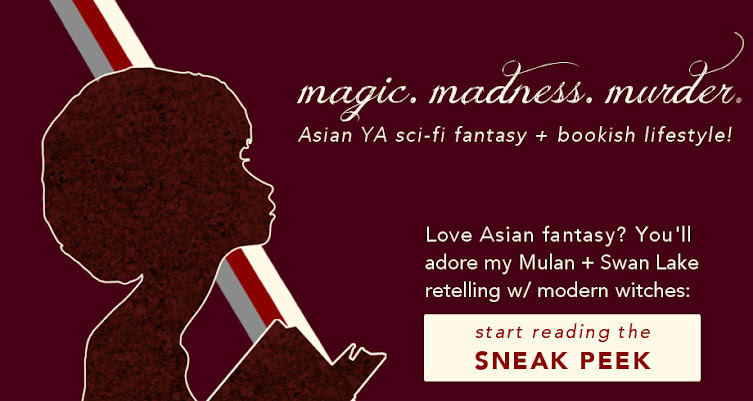 : If you enjoy the legend of Mulan, you'll love my modern re-imagining with witches, assassins, and magical snacks. Get updated with sneak peeks and the latest news about a grave robber taking down an empire of witches! To be honest, I think it's sad that there's even a question about casting a non-Asian actress to play Mulan. And as long as they do pick an Asian actress, I'm not picky about whether she's Chinese or not. Like you said, I think what really matters is whether or not Disney can convince us that it's a Chinese folktale. I know. It's like, why would you even do that? You wouldn't cast a Chinese person to be in Norse mythology, so why would you cast a Caucasian to play a Chinese character? Yeah, I think I'd be willing to give them that margin in East Asia, so long as they make it Chinese and not pan-Asian. What an awesome and insightful post, Alyssa! I agree with Alex's thoughts. I would *prefer* if they picked a Chinese actress (any "kind" of Chinese), but I'm mostly good to go as long as she's Asian and that she can play the role of a Chinese warrior WELL. Also, if ever they're going to have Chinese speaking lines (bonus points to Disney if they do), they have to speak the lines properly. We have this local show where the main characters are Chinese, and they can't get the accents right--clearly they didn't even bother asking a Chinese person how to pronounce the words. ._. And YES to Chinese backdrops and clothing. Also the core values and just general Chinese culture. I don't think it's feasible to speak Chinese, not only because ancient people spoke really differently (like, entirely different dialects), but also because how would you switch between one and the other? Unless they subtitled the entire movie. But on that note, if everyone spoke in English and we pretended we had some sort of universal translator, they really should not speak with accents. Like, no. Why even? This is definitely holds a lot of interesting thoughts for me, especially because this is something I've actually discussed with my friends before. Being your average white girl, it's not like I'm expert enough to have an educated opinion, but I will say that at least to me, while I do hope they uphold the Mulan myth in all its glory, I don't feel as concerned about the race of the actress, especially if she is not "full Chinese." When we box off people who are of a mixed descent, it's like saying they don't belong to any culture instead of saying they belong to more than one. So, even though I didn't know that there are 55 ethnicities represented in Chinese culture, it doesn't surprise me at all. There are plenty of people from all different sorts of places where I live, too. And we represent America, for even if we came from all different places, this is where our loyalty lies. And that loyalty, to family and country, appears to be something that matters to Mulan, too. I'm really happy it's been discussed! Even if it is by the average white girl. I don't think it's a matter of being expert, just, y'know, using a bit of common sense and realising you cannot pass a Caucasian or any non East Asian off as Chinese. That's definitely important. Biracial people definitely shouldn't be fenced off from either side of their identity. And *coughcough* I'm gonna have to differ on the "all the Chinese ethnic groups like China!" I mean, in history the Han Chinese kept conquering the border groups. And Tibet is still an issue. But yes, there's still more kinship between us. Yeah, Mushu was cute. But still, in a live-action movie? Would probably come off as hammy. Yeahhhh... Didn't think about that. I'm sure there are a lot of people who still have a lot of resentments toward the conglomeration of ethnic groups when they'd rather not conglomerate. That was kinda stupid of me. But yeah. It's not stupid at all! I mean, I used to think racism was over in America, so really, everyone should be given a learning curve, especially outside of their own country. *whispers* We'll see. If they can do it well I would like some Mushu too. I'm super excited about about this film, although I didn't know there was such a debate regarding casting Mulan. I agree with your thoughts, though. Just convince me. Obviously, I'd like the actress to look Chinese. But it does bother me that people are placing more importance on ethnicity than acting ability. In the end, I just want to see an epic tale, set in a real China. Really hoping Disney comes through on this one! I'm glad you're excited, because SO AM I. I actually didn't either until I came across quite a few posts that inspired me to write my own! And yes, if it came to, say, a choice between a really damn good Korean actress or a less-good Chinese actress, I'd settle for the Korean. Because I'm looking for a movie, not a social justice documentary. YES. Real China is a go. Disney, hear us. Very interesting thoughts. You made me excited to see the movie when it comes out. I hope they stand by all your rules. I love that Mulan is becoming a live action film. however, since the incident with pan about tiger lily, yes, i feel like mulan needs to be chinese. but even more important than that, i need to be immersed in the setting and culture for sure. it needs to FEEL like China with the way people act, and I agree with that. I KNOW RIGHT? ALL THE EXCITEMENT. Oh, yes, the Tiger Lily debacle was totally shocking. I just don't believe there aren't non-white actors who could've played that role well. Like I say, I'm willing to be flexible on which actors can be called "Chinese", but not on the entire Chinese atmosphere. I didn't know Disney's going to make a live action film about Mulan! That sounds really cool. For the casting problem, I think it all has to go back to WHY they want a Chinese actress. If she has to speak Chinese at some point, then yes, they probably need a Chinese actress (then again, back to your arguments, what is Chinese? And the whole ancient language thing...might as well just speak English, and YES to your comment above, don't do accent for goodness' sake, if it's already translated); if they only need someone who LOOKS Chinese (and again, YES Mulan may not even be Han) then just cast anyone east Asian (if they really need a Han actress) no need to complicate the matter 0_o . I don't know, perhaps they want the effect like "ooh fun fact, the actress for Mulan is ACTUALLY Chinese" ? But here's my question: if Mulan should look Chinese, should the other characters also look Chinese? I mean, it's set in China, after all. I do realise it's pretty much impossible to do so, but it'll be really weird and kinda half-assed if only Mulan looks Chinese and other people look all Caucasian. I agree with you though, the least they can do is to convince us that it's a Chinese folklore. It's just...why is it Disney that's doing it anyway? It'll be hard for them, no doubt, but I've never seen ANY adaptations on the story of Mulan made by Chinese people. I'm a confused bunch of cultural mess right now :P .
Oh, on a completely unrelated note, can you so italics in comments? How? I've never tried but thought it'd be really nice, in fact WAY better with the all caps I did to emphasise some of my points. Yep, that is absolutely really cool and I would love to see it actually! And yeah, I mean, it's not as if China's restricted to one dialect even now. I think the debate is more that after Pan in Tiger Lily, everyone's worried Disney might whitewash the actress, and so online people are saying "actress must be Chinese, no exceptions!" I'm pretty sure they should at least find Asian extras. I don't think that'll be a huge issue? Disney probably has the ability to film in China if they can't find said extras in USA. And actually there is a Chinese Mulan remake! It's called Rise of a Warrior, I haven't watched it but I will to do a comparison in the future! Whoops, something went wrong there. It should be < i >like this< / i > without any spaces. Looks like Blogger tried to eat my HTML. I think less people will kick up a fuss about the secondary characters, and I'm willing to give them an even larger margin with those too, but no whitewashing. Seriously, no. Ah, yes, that is true. Perhaps I should include these reminders myself. Right. *more sigh* AND YOU TOO, ISIS. Haha, perhaps it's just me feeling weird, but yeah, no white washing, that's for sure. I will probably just be so sad if they do that. Why, Disney. I hope they portray Mulan well, although if they don't, I'd be merely disappointed. After all, how can a Disney movie ever compare to an ancient Chinese ballad (your reading of it was awesome, by the way)? Although if they cast a Caucasian actress to play the part of Mulan (assuming there are other choices), I think people have a right to be a little miffed. But you know I'm always calling for proper representation in pop culture. :P Those requirements are a little dubious to me, as well. You posed very strong counter-arguments. 'China' could mean anything. It is present in other Asian cultures, after all. I think it would be important to have someone who is of Chinese descent for a main character, though. What about you? I'll be more than a little miffed if they whitewashed Mulan. Or any of the other characters. Hmph. I'm glad you agree with my arguments, at least partially. That would definitely be preferable! I mean, if it came down to two actresses of absolutely equal acting ability and other things, obviously I'd go for the Chinese one. I would like the actress for Mulan to be Asian or half-Asian (basically someone who looks Asian), because it's an Asian story, so to have someone who ISN'T Asian in the role would be weird. I think having a Chinese actress would be awesome, because I think it would keep some authenticity, especially if the language was used, but I don't think it's necessarily a must. I know that when a Chinese actress was cast as the main character in Memoirs of a Geisha it really angered and upset some people. Many thought that the actress should have been Japanese, since the character was Japanese, not Chinese. I think that there will be some people who feel the same way about Mulan being Chinese. But from an entertainment perspective, as long as the story is true to the original, respectful, and culturally accurate, I think that the specific Asian ethnicity of the actress cast as Mulan is much of a muchness. Hmm, yes, it's important that I can think it's a Chinese folktale if I don't look at the cast list. It's definitely the best situation if we can get a Chinese actress, but I'm willing to give Disney a margin if they don't. OHHH. I didn't know that. One possible difference here is that like I mentioned, Mulan's story was set a really long time ago and possibly not Han Chinese, whereas geisha are definitely primarily a Japanese custom. So it's possible the backlash won't be so great. And yes, what's important is the story and the setting and so on, not just the cast! I definitely think whoever plays Mulan should look Asian at the very least—I agree with you that the live-action Mulan (even the thought just makes me go SQUEE) should convince us that this is a Chinese folktale. At least, as long as the movie doesn't pretend all Asian cultures are the same with casting/settings/fashion/cultural elements, because that is another unpleasant and disrespectful pot of stew entirely. (I have nothing against stew; it's just that I can't think of another comparison.) But you bring up some really great, thought-provoking points about the definition of "Chinese" that shouldn't go unaddressed. Great post! Also: "Do NOT turn Mulan into some Western altar of rebellion and individualism" —I AM ALL THE AGREE. THIS IS IMPORTANT. THANK. I will laugh and cry simultaneously if they try to do that. Applicability? Totally fine. Allegory? We CAN tell and we will frown. This is so hard because I feel like as a caucasian person, I don't want to overstep and say something that would upset anyone, BUT, I do think that Mulan NEEDS to be Asian. Like, no question. I can't believe that it's even up for debate, that's so very sad. It'd be like having a movie about say, Martin Luther King Jr. and having some random white dude playing his part! That isn't okay, because that simply isn't accurate. As for the actress having to look like some kind of stereotype of a Chinese woman, THAT is not okay either. Like any other ethnicity on the planet, there are tons of variations in looks. If anything, pigeon-holing the looks of the actress ultimately does more harm than good. That said, I am 100% certain that there is an amazing woman out there who is perfect for the role, both in looks AND in acting ability. And if the movie is true to the story and the culture, and respectful of the Chinese traditions, what percentage of her ancestry is Chinese shouldn't make a difference. This post is incredibly well done and thought provoking, Alyssa! Thanks so much for sharing it! I don't think you should worry about that, really -- I mean of course you might have misconceptions, but then again I am sure I have misconceptions of the western world. And yes, that's a good comparison. *nodnod* Exactly, in the long run it causes more harm to insist that she MUST be Chinese, and look like the stereotypical Chinese person which doesn't exist. I also hold to that belief. And yes -- there are more important things, and I'm glad you agree, Shannon! Thanks for dropping by! Your thought-provoking posts will always become my favorite! *hugs post* I think anyone can portray as Mulan so long as that person is Asian, simply because I feel it would correctly reflect more on the Disney story. But the person doesn't necessarily have to be Chinese. I mean, she CAN; however, personally, it would also be okay if not. I totally agree with you on your first point -- "Do not turn Mulan into a Western altar of rebellion and individualism." YES. Thank you, Jillian! And yes, anyone East Asian, or even a little more southeast to Malaysia or Vietnam or so on would still be okay for me personally. I'm pretty sure there will be people with their reasons who will be unhappy, but I'm not too hung up over it. And I'm so glad you agree with that post too! I was a bit weirded out by seeing people say that Mulan might NOT be Chinese. I mean, um, WHAT ELSE WOULD SHE BE??? It's A Chinese story for goodness sakes. But I totally get what you mean also. But probably we should all just sign a petition and get you on the Mulan-movie-making-team so they do it right. Yes? YES. I really like the sentiment behind a Chinese actress playing Mulan (and Chinese actors playing all the Chinese roles in Mulan), but you're right, it does raise a lot of interesting questions about cultural and ethic identity. Would an ABC (or CBC) actress be Chinese "enough"? Gosh, I think they'd have to subcontract it out to a Chinese film company to get that many Chinese characters. Or at least do the entire thing in China. Yes, that's definitely another contention -- if you won't accept people who aren't entirely ethnically Chinese, what about people who don't even embrace their Chinese side that much? *nodnod* We'd all be getting out our warhammers. Yep, I definitely agree we have an abundance of actresses from a range of ethnicities that we can pick from -- it's not as if we don't do some cultural borrowing amongst ourselves in the East and even Southeast Asian region. Thank you for dropping by, Evi! Old or new post, your comment is equally appreciated. This is one of the posts I'm proudest of, so I'm delighted you enjoyed it!